Football accumulator tips for this week’s Tuesday evening matches including the reasons for each pick and which bookmaker to use on our footy acca tip. 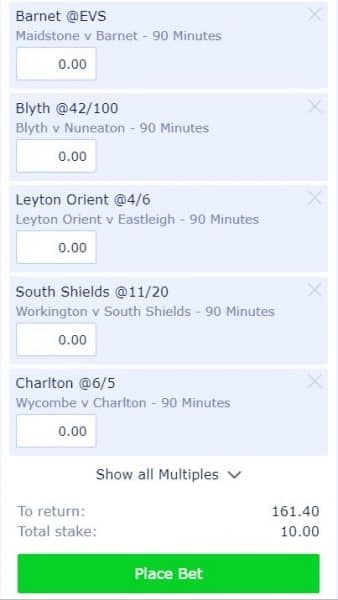 Although Champions League action resumes this weekend, this Tuesday accumulator concentrates on domestic fixtures which includes Charlton’s attempt to secure more promotion points at the expense of Wycombe. National League action is also covered with Leyton Orient attempting to enhance their title prospects and Barnet hoping to overcome relegated Maidstone. Sixth and seventh tie action is also featured with games at Blyth Spartans and Workington. ADD TO BETSLIP – add this accumulator straight to your betslip via this link. 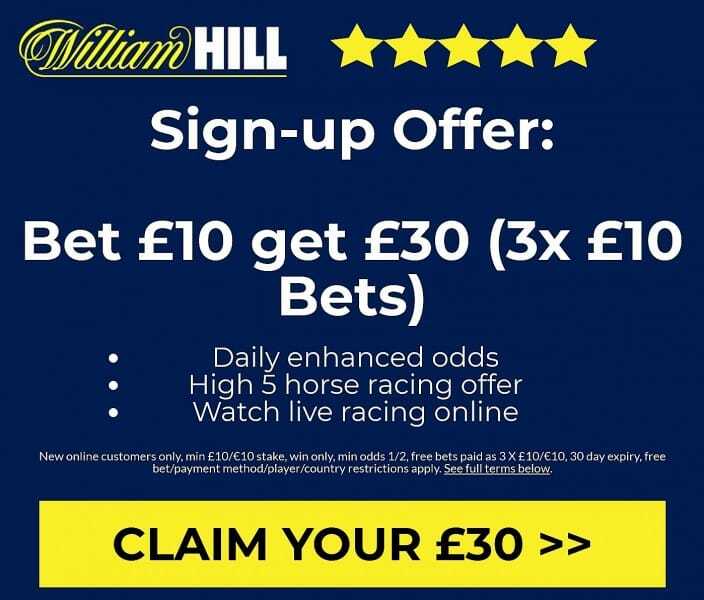 Sign-up to William Hill > bet £10 > you get THREE free £10 bets. Wycombe vs Charlton Betting Tip – Charlton win. After claiming a fifth victory in seven League One matches when beating Plymouth 2-0 on Saturday, Charlton maintained their slender hopes of securing automatic promotion, but they were outplayed for much of the first half in that game with the hosts missing a penalty at 0-0. 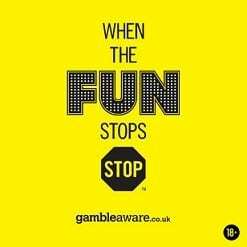 Yet no team has netted more than once against the Addicks this year and they now face a Wycombe outfit which has conceded 21 goals in a winless sequence of nine matches. The Chairboys have also lost four successive games with late winners netted in two of those contests. Another loss is looming for Wycombe. Leyton Orient vs Eastleigh Betting Tip – Leyton Orient win. Automatic promotion from the National League remains the target for Leyton Orient but a winless sequence of three matches threatens to dent those ambitions. Orient needed a very late equaliser to claim a 2-2 weekend draw with Halifax but they now host an Eastleigh outfit which has conceded seven goals in losing two consecutive games. The visitors have registered just one clean sheet since the beginning of March and Leyton Orient should claim a fourth home win in five games and return to the top of the league. Maidstone vs Barnet Betting Tip – Barnet win. A 2-0 weekend home defeat by Salford confirmed the relegation of Maidstone from the National League and they have not been helped by losing seven of their last nine fixtures in league action. Visitors Barnet are unbeaten in eight matches with clean sheets recorded in their last seven fixtures. With relegation fears disappearing, the Bees now appear to be enjoying their football and they should add to the misery of Maidstone by sealing another three points. Blyth Spartans v Nuneaton Betting Tip – Blyth Spartans win. Relegation from the National League North has already been confirmed for Nuneaton after a miserable sequence of form from late December onwards with the just one victory earned. That win was claimed recently at second bottom team FC United of Manchester, but the Borough must now travel to North East England with hosts Blyth Spartans currently enjoying a decent sequence of form. Spartans are unbeaten in five games and scored three times apiece in winning three of those fixtures. A home win goes in the acca tips. Workington v South Shields Betting Tip – South Shields win. A fourth automatic promotion is the aim of South Shields ahead of this Northern Premier League fixture at Workington. After experiencing a mixed set of results during February and early March, the Mariners have now won five successive games with at least two goals netted per game. Hosts Workington are struggling at the foot of the league table with a 1-0 win at Whitby sandwiched in between six losses. The Cumbrians lost 4-1 in the reverse fixture and appear likely to suffer another defeat. Read More: See our Liverpool vs Porto betting tips for tonight’s game.